Earlier this week I posted about the work we did over the weekend to install the glass in our salvaged French doors. These doors will be the new entry to our house, so I spent a significant amount of time making sure that I did an adequate job on the glazing so that it could look good and last for many years to come. I figured I might do a small glazing tutorial at some point since I've done it a bit here and there, and a few comments on my prior post expressed interest in just such a tutorial. So I figure it's as good a time as any, so here goes. Pros out there, please be kind, I'm a tried and true amateur at this. But I did put together a little video at the bottom of this post that outlines most of the process. In any historic home renovation it is important to make sure you get the windows right. An old home's windows are its eyes on the world, and nothing makes an inappropriate update jump out at you like bad windows. If you didn't know prior to this post, I'm a huge window snob. Yep, this is another "Alex on his soap box" post, it's just disguised as a tutorial. It's my opinion that removing old windows and replacing them with modern windows in an historic home should be a crime. Simulated divided lite windows are the vinyl siding of the 21st century, and any promise of a new window that is more cost effective, energy efficient, and green than a properly maintained wood sash with a storm window is just pure BS. Ok, I've stepped down from my bully pulpit, sorry if I've offended those of you with replacement windows or vinyl siding. It's okay, I don't dislike you, I just think less of you... I kid, I kid. All joking aside, the key to an energy efficient old window or door with glass lites is the proper maintenance of the unit. That includes the periodic maintenance of the glazing (every 75 years or so if done right), and the possible need to replace a pane or two when an errant batted ball or tossed snowball flies through one (I'm looking at you, Connor). It's for this reason that I hope my tutorial may be particularly useful to anyone who has known the pains of dealing with these panes, and would like to make sure the job is done right for the longest lasting results. The first step in any project is to ensure you have all of the tools and supplies you need and that your work is fully prepped. The tools for this job are pretty simple. You'll need a standard putty knife, a 2-In-1 Glazing Tool , two new razorblades, some paper towels, and some standard glass cleaner. The supplies you will need may vary slightly based on the job, but overall should be pretty standard. 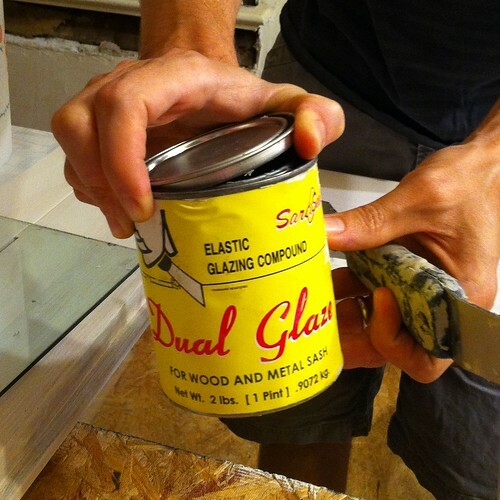 The primary item you'll need is the glazing putty or glazing compound. Stay away from the stuff in tubes, anything silicone based, or anything that promises a fast drying time (especially same day). All of this stuff should be considered garbage. It will either fail shortly after install, will crack prematurely, or worse (in the case of the silicone), it may actually fracture your glass. 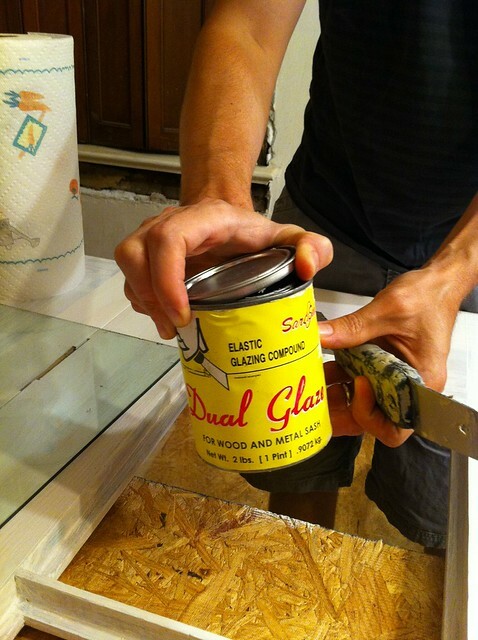 Instead, opt for some standard glazing compound in a pint, quart, or gallon can. You can usually find the standard DAP '33' in one of the local or big box hardware stores, but don't jump too fast on this product. The issue here is that the DAP takes an inordinate amount of time to skin over before being able to paint, it can't easily be applied to a vertical surface as it can have a tendency to droop and sag, and you can't easily touch it with your hands (it can be a real mess). There was an older formula that worked better, but the stuff you can find now just seems to be way more of a mess. Not sure what happened. Rather than using the DAP, it may do you well to look into one of the putties that professionals tend to use in their restoration applications. These putties are oil based, typically with vegetable oil or linseed oil, and allow you to work them with your hands. Once worked, you can form it with a putty knife, and will skin over more quickly than the DAP (usually in a matter of days or a week depending on conditions and the type). Two such products are Sarco Seal's Dual Glaze or Sarco Seal's Multiglaze Type M.
These two glazing putties are soybean oil and linseed oil based and will remain elastic after curing to allow for expansion and contraction of your window or door. More importantly, they will allow you to work them with your hands, will skin over in as little as 2-3 days for the Multiglaze or 5-7 days for the Dual Glaze, and are the choice of professionals in window restoration. The Multiglaze Type M is meant for glazing within the controlled temperatures of your workshop and should skin and be painted prior to install. The Dual Glaze product is a similar makeup but can be installed indoors or outdoors and in a vertical manner with immediate use. Essentially, if you want to replace a pane of glass without removing your door or sash you will definitely want the Dual Glaze product. I chose the Dual Glaze simply for the flexibility it affords even through I was glazing in my "shop." One final note on the glazing compound. I've heard that you probably shouldn't keep the oil based glazing compound for more than 2 years or it will begin to separate, harden, and is more likely to fail after install. There's lots of information about keeping what you don't use stored within a zip lock bag in the freezer, but I think it is best to just order just the amount you need and try to have little waste. You can find this particular putty at a few online suppliers. I bought mine from Abatron, but you can pick up the Multiglaze from Smith Restoration Sash. It's more expensive than the DAP '33' and not as readily available, but well worth the additional cost. The other critical element you'll need for your needs are glazing points. Glazing points hold the glass in place while the putty cures. There are couple types of points that you can use, flat triangle points, small diamond points, and push points with ears . Though I've been toying with the idea of purchasing a Fletcher-Terry point driver. But until then, I'm using the push points with ears . You may be wondering "Why the push points instead of the triangle points that are more historically accurate?" Well, I had a bad experience with the triangle points a few years back when I broke an 125 year old piece of glass I had lovingly cared for and coddled for years leading me to be silent in my furiousness and nearly throw myself out of the window. I'm still a little upset about this if you can't tell. After you have your points, your tools, and your glazing putty, you're ready to go on with the install...almost. Yep, you need to fulfill a few prerequisites before you launch into full scale glazing. This is a big one. I mentioned it in my last glazing post as well. PRIME YOUR SASH OR DOOR BEFORE YOU START GLAZING!!! You'll see, read, hear, infer lots of conflicting information on this aspect of your glazing, but trust me, prime your sash or door before you apply your glazing putty. Also, I like to use oil based primer to ensure maximum protection against the oils going into the wood and leaving the putty to dry out. If you don't prime your sash, the oils in the putty will be sucked up by the thirsty wood, causing the putty to dry out too rapidly. This rapid drying will cause the putty to crack prematurely, and will allow water to infiltrate those cracks, causing further failure in the putty. Before you know it, your newly glazed sash are letting water in against the wood and destroying your project. The final prerequisite is to pre-cut your glass for the sash. This is sort of a given, but you'll want to cut each piece and label where it goes in the sash. If you're looking for tools that will help you with accurate glass cuts, check out our old Toolbox Tuesday post on a good glass cutting tool. Do this before starting will help to ensure the right size glass goes to the right spot in your sash or door. And finally, clean your glass. This is an important step since it will clear away any dirt or debris that could interfere with the putty as you glaze. Just use a standard glass cleaner and a razor to get any stuck on crap off of the glass. OK, You're Ready To Glaze! 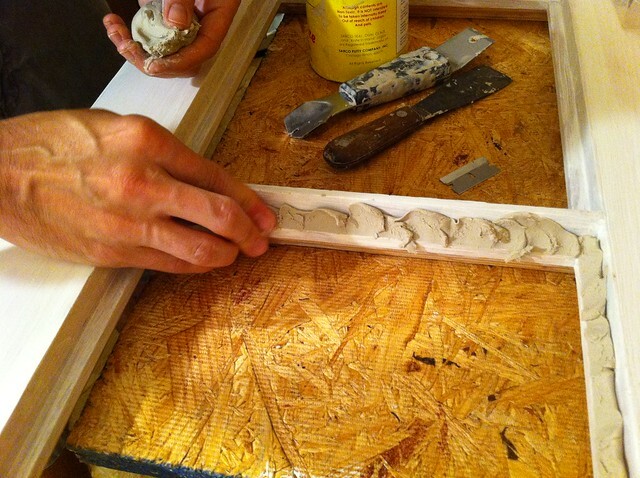 Once your ready to start just pop open your can of putty and use your putty knife to pull out a nice sized handful. You'll notice the consistency is sort of like a stickier version of play-doh. You'll want to work the putty in your hands a bit to warm it up and give it a bit more workability. When you feel like the putty is squishy enough (there's no hard and fast rule) you're ready to get started. From this point forward I'm going to generically call what I'm working on the sash, even though it is my door. It really doesn't matter, it'll just be easier to write. 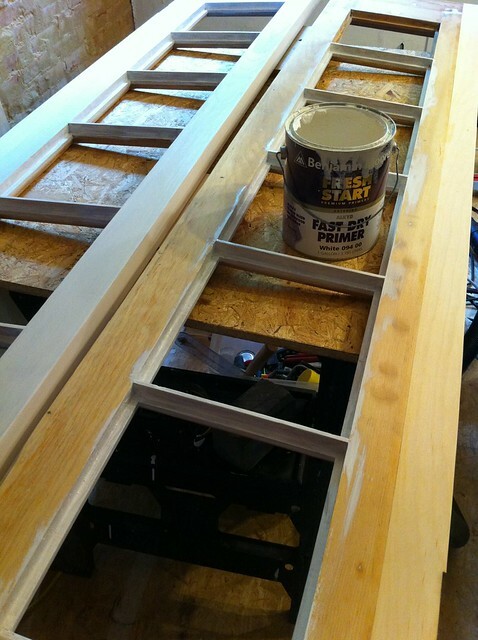 The first step in glazing is to back bed your sash. You want the glass to have a good deal against the front of the work. To accomplish this, take your putty and push bits of it against the inner corner of your sash. 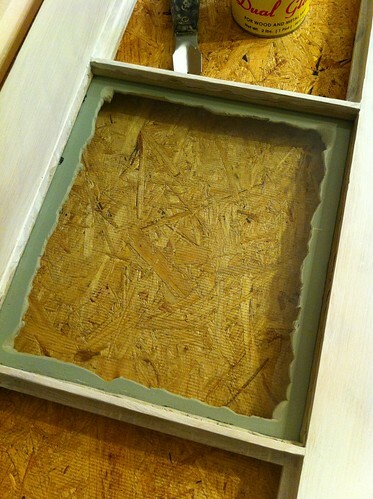 You'll want to fill all of the voids with your putty so that your glass has no air gaps between it and the sash. Some suggest rolling out the putty into a long bead and to lay it into the sash. I prefer to push bits into the sash since the rolled putty can leave gaps on the inside area of the sash. Once all of your putty is pushed in, you can gently lay your pre-cut piece of glass into the sash and against the putty. Next, gently push the glass into the putty starting in one corner and continuously working around the glass repeatedly until you've squeezed the majority of the putty out of the back side of the work. Don't try to push it all in at once, or push one side in completely before moving on, otherwise you may end up breaking your glass by putting too much stress on it. Instead, just push a little at a time and work in a clockwise fashion. 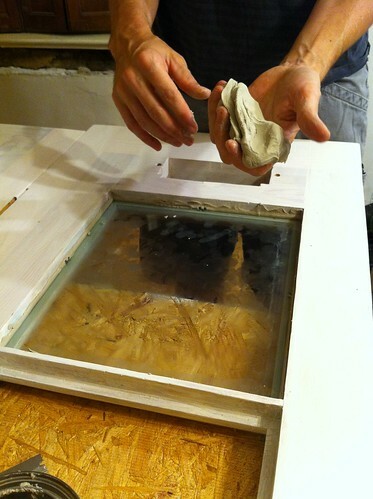 You'll be able to see if there are any gaps in your putty through the glass that you placed. 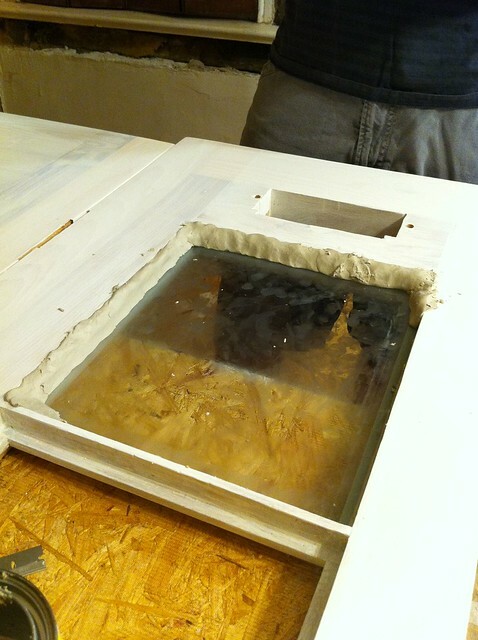 If there are gaps just take the glass out and start over with the putty. I know this sounds tedious, but you have to be sure you have 100% coverage. 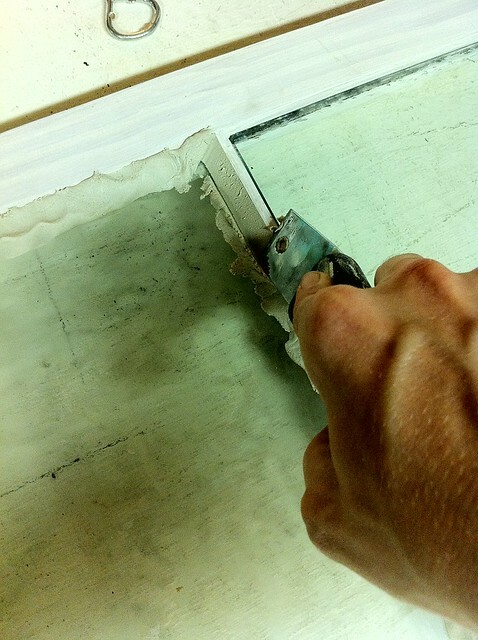 The next step in the process is to place your glazing points to secure the glass against the face of the work. 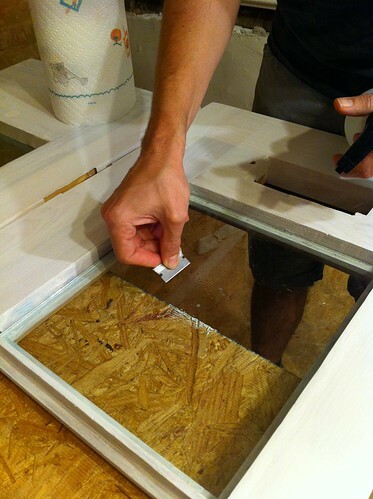 Using your 2-in-1 glazing tools, push the points into the sash with horizontal pressure. Don't push too hard or you will inadvertently place too much down pressure on the glass and will end up cracking it where the glazing point sits (trust me, it's not a happy feeling). 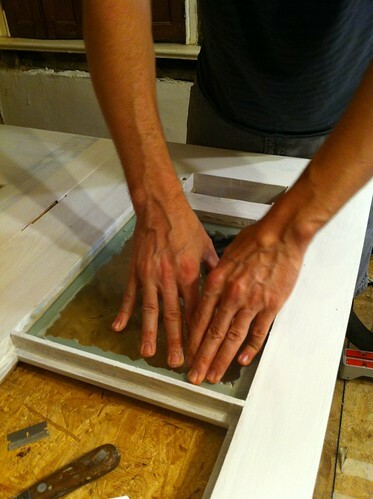 Instead, just work the glazing point into the wood, gently rocking it back and forth until it is flush with your sash. 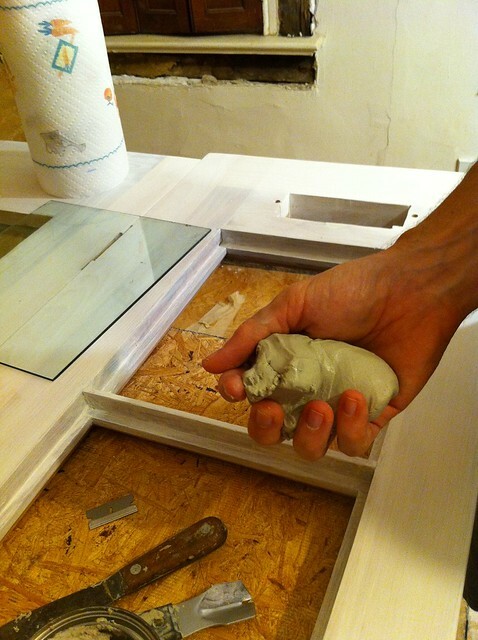 Typically you'll need to place at least one glazing point per side of the glass you're placing. If any side of the glass is longer than 12 inches, add an additional point for each eight inches of glass over 12. The last little trick I have is for older windows that have smaller sash channels. The glazing points with ears are sometimes too deep and will stick out of the glazing if left the full length. I like to use my pair of nail pullers (one of the most versatile tools I own) to snip off the very end of the glazing points. This little snip lets the points securely hold the glass in place without peaking out of the finished glaze. With the glazing points in place, your glass is secure so you can move your sash around without fear of it falling out. 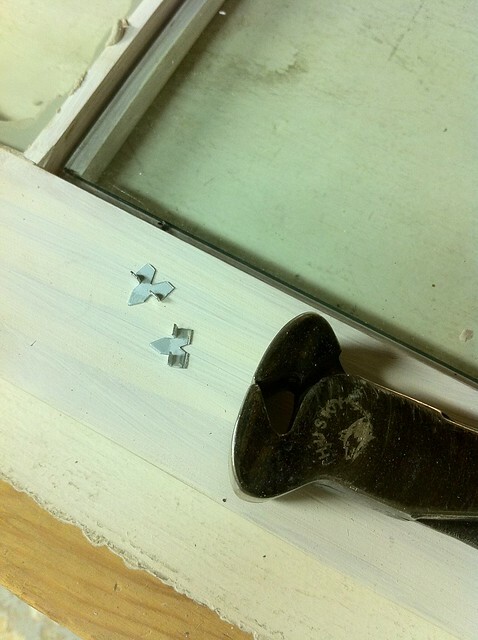 At this point, you wil need to use your 2-in-1 tool to remove the excess putty that has squeezed out of the back side of the of the sash when you secured the glass. It's important you remove the putty at this step so that you can see how deep to make your putty angle in the next step. You should also use this excess that you remove in the next step as well. To remove the excess, flip the sash up on its side or slip it over and scrape away the putty with the flat side of your tool. 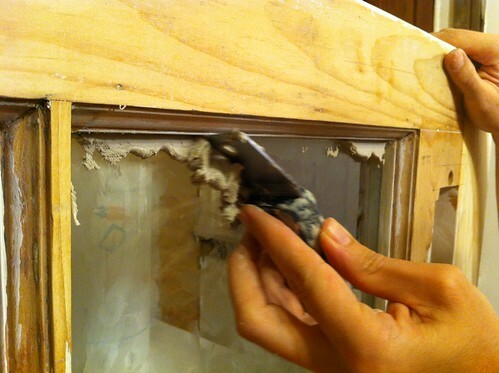 You'll want to make several passes here to be sure you remove all of the putty that has squeezed out, but be careful not to pull the putty out of the area between the glass and sash. 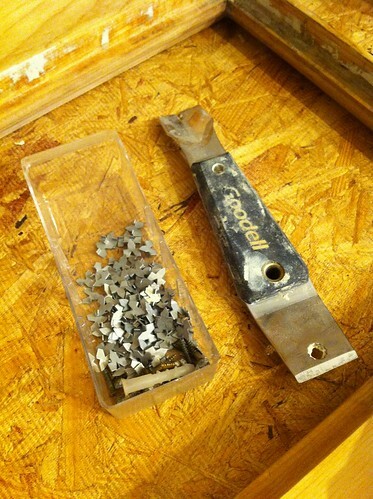 If you are having a difficult time, flip the tool over and sort of scoop/scrape the excess away. Be patient and methodical, and don't rush this. You should be left with a very smooth and thin line of putty between the glass and sash. If you'd like, you can also wipe away the excess that is left on the sash with your finger, that tends to smooth things out. Now flip the sash back over or place it back flat on your table. 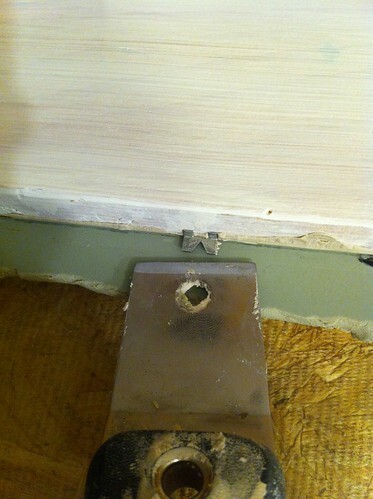 You can see that removing the excess putty gives you a clear view of where the sash actually ends. This will be your guide for removing the excess while forming your sharp edges. Using the excess that you pulled form the back side, and a little more putty from the can, roll out a big ball of putty and place it around the perimeter of the glass. Push this roll of putty into the edges of the sash with your thumbs, but leave it overflowing so that you can remove what you need to with your knife. This next step is all personal preference. Everyone does this a little differently and feels more comfortable using the tool of their choice. You can use a putty knife, bent glazing knife, 2-in-1 tool, razor blade, or even your thumbs (but you need to be seriously skilled for that...I'm not). I prefer to use the flat side of the 2-in-1 tool for this step in the process. Holding the tool at a slight angle hold the blade between the corner of the sash and the glass where you'd like to remove the excess putty to. Then, in a consistent move, drag the blade along the sash holding the base against the glass. This will create a smooth and consistent removal of putty and a nice and flat angle to your putty. Your goal is to just barely see the back side of the sash through the glass once the putty is removed. This will leave a clean line on both sides of the glass and will allow you to paint the putty right to the glass without issue. Don't worry if the process pulls or fuzzes up the putty a little bit, or if it pulls the putty away from the sash, you can easily fix this later. Don't try to futz with it with the tool, you'll only cause bigger problems that will cause you to redo the whole side. One thing that may help out with the pulling/fuzzing is to oil your knife. I've not done this but will be trying it out in the next few days. You can see some of the problems that are being caused by the blade pulling on the putty too hard and not just smoothing. As you reach the corner of the sash you have two options. You can either lift the knife up and away into the corner, or you can try to be continuous with the removal. Pros are continuous and can knock this out in their sleep. I'm not that good, so I lift and remove, gather the excess, and start in the next corner. After you've used the knife to remove the excess on one side, and you are happy with how much of a reveal you've left, it's time to remove the excess. The putty knife or 2-in-1 should have left a defined line where the excess is separated from what's staying. Use one of your razor blades to get right in there and scrape the putty away. Do this carefully and you won't touch the putty that is staying. You'll need to get the hang of handling the corners, but remember, the more excess you can remove, the less extra you have to get in your way. The final corner is the trickiest since the material you're removing will bunch up and push against the part you've already finished. I improvise with a razor blade at this point, cutting away a little at a time until I'm happy with the corner. There has to be a better way, but I've not found it yet. Once you are all set, flip up the sash and look at your work from the back side. This should give you a sense of how successfully you've removed the excess. You really shouldn't see any putty through the glass on the opposite side. 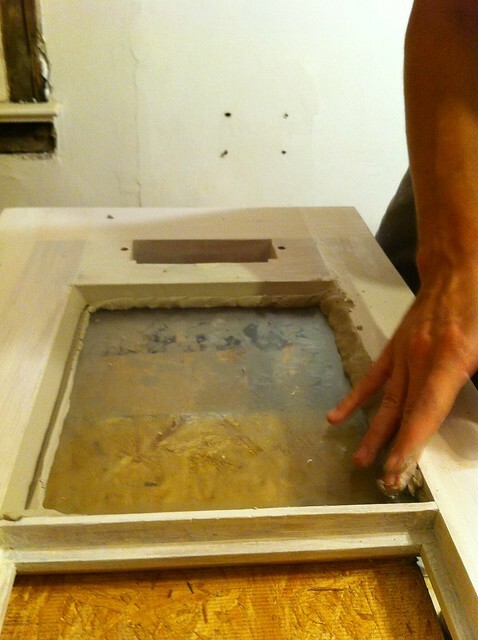 Repeat the process for all fo the panes you are glazing and then let the putty sit for an hour or two. Go wash your hands (your hands are a mess but dish soap tends to get this stuff off), take it easy, curse away your frustrations, watch some TV, whatever. After a few hours visit your project and look for all of the fuzz, imperfections, gaps, small holes, etc. Using your finger or thumb, gently...and I mean super super gently, glide your finger or thumb over the finished surface. The point is to apply almost no pressure, but to smooth the putty. This will sort of bring up the oily cream of the putty, filling in holes or gaps, and giving you a smooth and consistent finish. Here's the brief video I did to outline the whole process. Once you've reached this point, you've reached the waiting game. You need to wait for variable amount of time depending on the putty that you've used. Once the putty has skinned over you are free to paint. Be gentle, don't ding the putty, don't stick your fingers in it, don't bump it, trust me, you'll hate yourself if you do. Once the skin has formed prime the putty with oil based primer (some people say not to prime the putty, I guess it is personal preference) and then paint over the whole thing with your paint color of choice. When you prime and paint, ever so slightly overlap the paint from the putty to the glass. This is critical. The point of this is to ensure you have a good weather seal between the putty and glass. The paint you are applying will be this weather seal. Now pat yourself on the back, you've successfully glazed your sash or door and can sit back and look at your completed project. If all has been done well, you can assume this glazing can withstand the test of time and last for a good 50-75 years with proper maintenance (an occasional coat of paint). I hope this tutorial was helpful for you. I've glazed my fair share of sash and doors over the years in this house, and have learned plenty from my mistakes. If all goes well, my efforts will help you have an easier time with your work. impressive! sadly, simulated dividid lite (with spacer bars) is the best some of us building a new "historic" home are able to manage--costs even for these are outrageous. i agree with you about the appeal and energy efficiency of the tdl, but it's nearly impossible from a cost standpoint when outfitting a whole home from scratch. Hooray!! 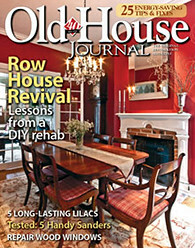 In all the reading I've done about old windows and how to restore them, this is the first tutorial I've seen, and with pictures! Well done...I can't wait to start glazing! I'm so glad you found this post useful. I've seen several guides here and there, but they all seem to skip major steps. Also...where did you get your glazing points? I have the originals that I removed from my window, but most are badly rusted from lack of care. I used to work at the big orange box near you, and assure you they DO have glazing points. Its in the nuts and bolts aisle, and you'd do better to ask for help, since there are tens of thousands of items in that single aisle alone. Whitney is right, you should be able to find them at your local big box. If not, the link in the post goes to a stone on Amazon where you get buy them too. I would prefer to use the originals, but it's way to easy to break the glass if you don't have a glazing point tool for putting them in. Good luck. Thanks so much for this great tutorial Alex. My 90-year old front windows that have the most beautiful wavy glass you've ever seen but the glazing is so cracked and warped I can pull out chunks with my fingers. Not sure if I can get the sash out, but I'm going to give it a go. I'll probably practice on some old windows I have in the basement before I attempt the front windows. I'll hate myself if I break that glass. I know what you mean on hating yourself if you break the glass. But if you do, you can always go to Community Forklift to get an old sash to steal the glass from. I know, it's not the same, but it lets me sleep at night. Good luck with your project. I never thought I could have gotten our bedroom sash out, but I was able to free it after hours of razoring and gently prying. Remember, wear gloves and bring your patience. Tiffany, I can imagine how expensive this would get with any normal amount of window. TDL and traditionally constructed window sash are NOT cheap! That's for sure. Our house only has a few windows that we need to replace (these are modern replacements that I want to bring back to the way they should be), but I'm going to be building the sash for the few we need to replace, the cost to have them built is way too much. Our historic district accepts the SDL windows as adequate replacements, so we still see a fair share around our way. you guys are so lucky to have all the authentic features in your home and it's awesome you know how to restore everything so accurately! i really envy all the history your house has. love these posts! With all the attention to detail you and Wendy have put into your home, you'd better not ever move! It will be a veritable PALACE when you're "done" with it!! Thank you thank you thank you! My husband and I are refinishing the old windows in our garage, and your tutorial is going to be so helpful. I do have to hang my head in shame, though... when we moved into our 1905 house 7 years ago, we replaced all of the windows with vinyl. I was obsessed with not having to use sticks to prop open windows any more (having grown up in a huge Victorian home). Thanks so much for the tutorial. The one time that I had to replace an entire sash, I pulled the stop from the inside, unhooked the entire thing from the weights and hauled the entire unit to the glass place. Thank goodness my son's errant tennis ball didn't go all the way through the storm. (Exited dog plus excited kid equals tennis ball moving at high velocity LOL). Now I think I would be able to at least attempt the repair myself. We'll find out next weekend when I attack that missing pane on the back door. That's it. You're coming over to help restore the pair of doors I rescued from the basement of Eastern Market. Very nice and detailed tutorial. Thank you very much. i especially liked the "and I mean super super gently..." instruction. The only thing not totally clear was where you are snipping the points to keep them from sticking out. This is a great tutorial! This would have been helpful when I reglazed the window we bought from a salvage yard for an addition to my husband's workshop. My 1940's colonial has a den and enclosed porch with divided lite wood windows. The glazing is in horrible condition and is completely failing. The exterior of the windows are painted (obviously), but the insides are just stained. Is the glazing that seeps over to the other side easy to remove or will it damage unpainted woodwork? I'm nervous to try this myself and mess up the interior. Adding to that nervousness, if I am counting correctly there are 188 lites. Wow, that is a serious amount of glazing!!! The glazing that comes over is easy to remove and may simply leave a slightly oily residue. I think it may even wipe off of the stained/shellaced side easier than it would the primed/painted. Best of luck on trying it yourself. Hopefully you could start with one pane and see how it goes. I bet it would look amazing with nice and crisp glazing. Very nicely done. Thank you for taking the time to put this together. Thank you so much for the tutorial - I read it then referred to it a number of time to successfully complete my first window restoration. I replaced the old glass with tempered glass since this window is above my bathtub -- also used a patterned, tempered glass for the lower part of the window. Your tutorial gave me all the confidence I needed -- great list of products and tools. The mineral spirits helped at the end. Waiting for the dry time, now. I have quite a few glass panes broken or missing. I am planning to re-glaze them myself. Since it's winter time in New England, what would you recommend about which glazing compound and when to paint after glazing? 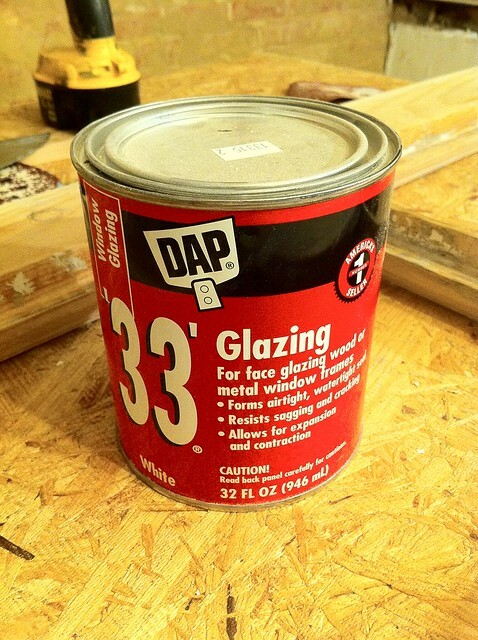 I thought about using DAP Latex Glazing Compound since it does not have to be painted. I know you are not a fan of these products. But if I use Sarco Dual Glaze or DAP 33, is it ok to wait until next spring to paint the glaze? I am afraid that the temperature is getting tool low to paint. Also, the glaze probably would not skin for a long time. And I have second floor windows that is best to be taken sash off for painting, although it is not a good idea to do this in New England winter. I would appreciate any suggestions. just some quick points about modern painting,ok the first one is folk think they need to use oil based paints,i personaly aviod oil based paints because of the down time etween coats,secondly modern acrylics are heaps better,but you need to buy trusted brands,high end ones,also clean ups and costs are reduced greatly even if you pay alot more for the paint,oil based paint is almost out of style and most hardware places do mainly acrylics now,but i will say modern acrylics are very long lasting and very easy paints to use,any putty is best being the old linseed oil type,use no more gaps in the big tubes for gaps around skirting and anywhere else boards meet the walls. video to show how to use the other end of your 2 in 1 ? "33" DAP can instructions say to make "round" corners ?